White noise is a term used to identify constant background noises within a certain range of sound. These noises are able to cover up over disturbing and unpleasant noises without bothering you at all in exchange. The science of white noise is well advanced and the benefits have been proven over and over again for many different situations. While most people use the best white noise machines for sleeping or other sources of white noise to help them sleep, there are a variety of great uses for these machines. There are many noises that can disturb you as you’re trying to sleep at night or take a nap during the day. It’s not always possible to get rid of whatever is causing the sounds, but you can mask them in order to get your rest. Using a noise machine in your room can assist you in getting the best sleep of your life. Just as adults get bothered by noises at night, babies can easily be woken up by sounds which are unfamiliar to them. Help your baby to sleep through the whole night and get the rest they need by using a white noise machine to cover up any sounds that could potentially disturb them. If you find yourself having trouble concentrating in an office environment that’s either too loud or too silent, white noise can soothe your senses and help you to focus more while you’re at work. In addition, you can use these machines to help keep conversations within offices private by masking the quiet noise of voices with a background noise. Sound therapy is practiced by a lot of people who want to feel their best all day. By playing white noise in your regular living spaces you can promote a great state of mind while also helping an guests and visitors to feel more at home in your house. While it might not sound appealing to have a constant, quiet noise playing in the background of wherever you are, you will feel the positive benefits and may not even notice the noise. Any time you want to relax, meditate, rest, sleep, read, or just sit you can put on some white noise to get your mind set into a more relaxed state. If you’re in the market for a relatively simple white noise machine that doesn’t have all the bells and whistles of more expensive types, this is the way to go. It’s a small device that’s easy to place anywhere around your home or office to provide natural white noise in any environment. The white noise comes out as a gentle wind noise that helps to mask other background sounds. This is a good unit for use in an apartment building to keep down the noise from upstairs or as a sleep assistance device for anyone that has trouble sleeping. If you want to adjust the sound that comes out of the device, twist the top cover to adjust the vents and sound holes until you are satisfied. 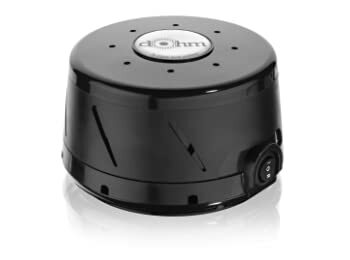 The Marpac DOHM-DS is good as a simple white noise machine, because it’s very easy to adjust and makes a pleasant sound. 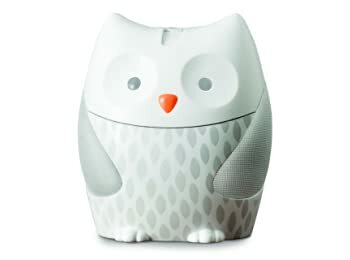 As a natural white noise machine, it has a richer and fuller sound than many digital machines. However, if you want to hear sounds which are not white noise, such as the ocean or rain, you won’t be able to listen to them on this device. Frequent travelers and those looking for a cheap, usable white noise machine, this could be a good choice for you to make. It can be difficult to sleep when you’re on the road all the time, but using a white noise machine such as this one will help you to stay relaxed and ignore all of the new sounds around you. This machine is compact in size and easy to fit in your suitcase or travel bag when you’re on the go. It’s not known to be a machine that will last you for 5+ years, but for the 1-3 years that it might last it can serve you well. During that time you’ll take advantage of the automatic timer feature, the 6 different available sound profiles, the battery or AC adaptor power, and the ease of making adjustments to the device. As a simple, straightforward white noise machine this device will be able to do the job. If you want more features or a very sturdy device, look elsewhere. Traveler might be able to get a lot of good use from this device. A sleeping baby is one of the most beautiful gifts that nature can give you. Unfortunately, if nature doesn’t do that job well enough, you might have to help out with something like this white noise machine. Most babies sleep very well with white noise in the background and this device provides 6 looped recordings to choose from to soothe your child to sleep. It’s easy to use and great for travelling. Two groups of people will get the most use out of the myBaby SoundSpa Portable: parents and people who travel. The portability of the device and optional battery power make it very easy to get around the world with you while the soothing sounds and white noise help your child get the best sleep possible every night. This is a mid-range device as far as price and sound quality are concerned, but it performs very well and is enjoyed by thousands of people around the world. The LectroFan has 20 different sounds that can be played including 10 variations of fan noises and 10 white noises to mask whatever is disturbing you. It is powered by a USB cord that can be hooked up to an AC adaptor and plugged into any standard US outlet. There are 3 buttons on the front to help you change the volume, set the automatic shut-off timer, and change the sound. Whether you want to use it in your home or on the road, this machine is equipped to handle the task. 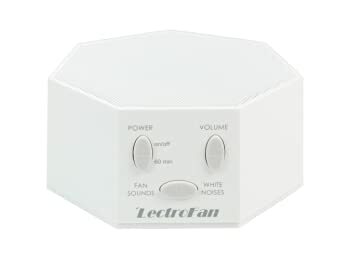 If you’re looking for a good machine to travel with and to use without hearing repetitive sound patterns, this LectroFan – Fan Sound and White Noise Machine makes a good choice. It’s not good for those who want to hear other relaxation sounds, such as the ocean or rain, as these options are not included. 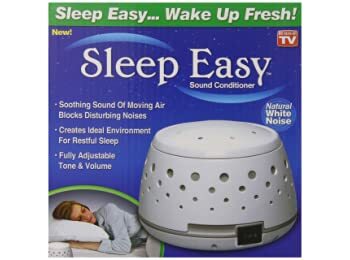 Sound conditioners such as this Sleep Easy device produce natural white noise from a small interior fan rather than relying on digital speakers to get the job done. Adjustments can be made to the volume and pitch that you hear by simply twisting the top half of the machine. This opens or closes various sounds holes on the body of the machine to change what you’re hearing and what becomes silent. There is nothing complicated about using this sleep conditioner, so you won’t have to worry about setting anything up before you go to sleep. All you have to do is plug it in and turn it on. From there the natural white noise will take over and soothe you to sleep. This is a good machine for someone who wants to try out a natural sound conditioner without paying the larger price tag on a premium model. It works well for the price, is simple to operate, and is very easy to travel with. Erratic and inconsistent noise is no problem if you get this adaptive white noise machine. It has a patented technology that allows it to adjust the volume instantaneously when there is a sudden change in noise, such as a very loud noise that happens at once. You simply have to set the regular volume you want and the built-in microphone will detect anything out of the ordinary that might require a louder sound to drown it out. This is a feature-heavy white noise machine of premium sound quality. There are 10 rich and complex sound stories for you to choose from with different layers of audio you can add or take away from each one. Take advantage of the automatic shut-off time for a slow fade from noise to silence once you are fast asleep. Anyone who needs a more feature-rich sound machine will be happy to get this one. It has great sound quality, awesome relaxation sound tracks, and enough features to make your experience fully customizable. If you want a simple device, this is not a good option for you. 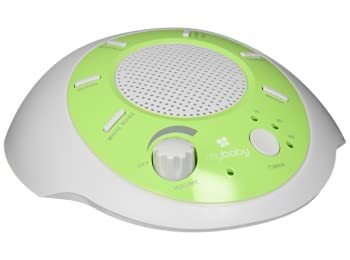 It’s easier to get your babies and children to fall asleep when you put a sound machine like this one in their nursery or room. The design is very cute and unisex, so you can easily use it for a little boy or a little girl as needed. Let your child enjoy the soothing effects of a soft glowing nightlight and beautiful projected light-up stars on the ceiling alongside the white noise sounds. There are options such as an automatic shut-off timer to help you keep your little one asleep in a great environment all night. Choose between 1 of the 4 nature sounds or the 4 lullabies programmed into this machine. Your child will get some of the best sleep in their lives, meaning you will too! 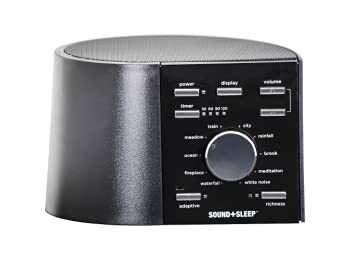 This is not a good white noise machine for adults, as the sound quality is not really high enough for most adults to enjoy the noise coming from the device. Kids don’t mind and are very well soothed by the combination of lights and soft sounds. It is a great choice for babies and young children alike. The sleep sheep is just as cute as the name sounds. It’s made from ultra-soft plush material that is perfect for babies of all ages and young children as well. 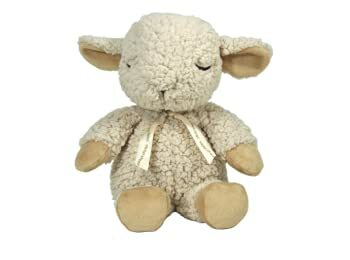 The soothing nature sounds that come from this sheep make it a great resource for helping your child sleep, as well as a fun toy for them to play with during the daytime awake hours. You won’t have trouble operating this little sound machine as the only controls on it are on the paws. Both paws do the same thing, which is to turn on the sounds and to switch between the different sounds available. It takes 2 AA batteries to keep the sound going, so your baby can take this sleep sheep around with them anywhere they go to help them rest and relax more effectively. If you want a quick, cute, and functional gift for a baby shower or any other occasion, this is a great choice to make. It’s not meant for children above the age of 10, but it’s perfect for younger children and babies to use at night and play with during the day. Anyone who travels a lot knows that you won’t always end up in an area that’s conducive to good sleeping habits, so what do you do if you have to sleep in a room that’s too dead silent or too loud? 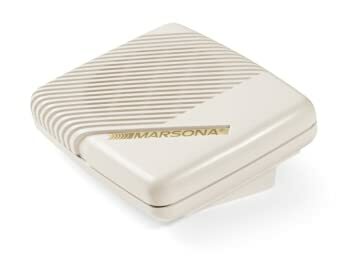 Carrying a white noise machine like this Marsona along with you as you go is a sure way to help yourself get the best sleep you can without causing too much trouble. This device is sized just right for travelers, as it’s just a bit bigger than most medium sized wallets. It’s easy to pack and well worth the little space it does take up. Sound quality is surprisingly good and will help you to feel relaxed and even fall asleep in all the places you wind up on your travels. International and US domestic travel are all possible with nothing but plug adaptors because of the built-in voltage adaptor in this unit. For anyone that needs a little help getting to sleep when they travel, this device can be a lifesaver (or at least a sleep saver!). 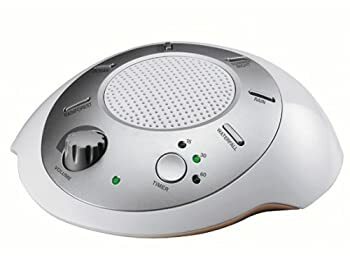 If you just want to use a white noise machine at home, you can look for one in a similar price range with more features, as this one is designed to be simple and compact. Sound Oasis has been making white noise machines for years. This model is one of the latest that they produce and it shows that by offering a lot of features that other sound machines don’t have. The main feature that’s fairly unique is the ability to swap out sound cards to get a different set of 6 new sounds to play through your device. You can put this sound machine almost anywhere in your home as it can be wall mounted, standing, or can rest flat on a hard surface. Speakers are located on the back of the device, giving it a deeper and richer sound quality than you would expect. Use features like the built-in timer, alarm and digital clock, and headphone jack to help you get the best use of this machine that you can. 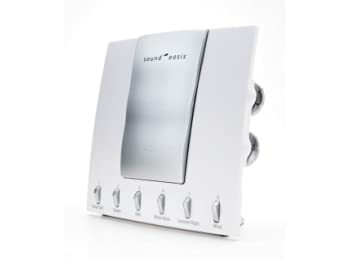 Those looking for a feature-rich midrange white noise machine have found it with this Sound Oasis S-550-05 Sound Therapy System. It is highly customizable and looks great wherever you decide to put it in your home. You can also travel with it fairly easily. If you want a simple machine or a white noise machine with excellent sound quality than you need to keep looking elsewhere. White noise can be generated in two ways: by creating sounds from the air and environment around you or by playing recorded sounds. Each machine has its own benefits, but generally speaking the former is more effective than the latter. However, it will also be more expensive. Do you need features such as a timer to control how long the white noise is playing in the background? How about a backlight adjustment for those devices with LCD screens? Check out what features you want on your machine. There is a difference between a sound machine and a white noise machine. Some devices operate as both, but some are specifically one or the other. White noise machines play a specific type of noise while sound machine play an array of different sounds. If you want more than a small handful of choices for sounds, choose a machine with more options available. Make sure the machine you choose has noise profiles that suit your preferences. Make sure you have enough space to easily fit your white noise machine wherever you are looking to use it. This is especially relevant when you plan to use it in a small office or on your bedside table. Not all machines are created equally. While some people might get great benefits even from a white noise machine with low sound quality, most people will find better results from a machine with great sound quality. If you want to use an all-in-one device in your room, choose a white noise machine with a built-in alarm clock features so you don’t have to have too many devices on your bedside table at once. You can usually choose between a machine with a regular AC power adapter compatible with any outlet or a chargeable USB battery pack. It’s hard to say which model is the best white noise machine for sleeping, as that depends mostly on your situation. However, there some machines which are considered better than others simply because of their higher levels of quality. The higher quality the machine is, the more likely it is to be useful in all situations and for all people rather than working for selective circumstances. Read through the best white noise machine reviews and make the choice that is good for you and your needs!